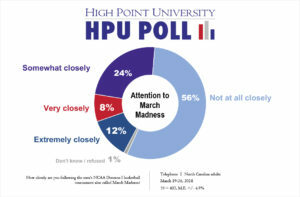 HIGH POINT, N.C., March 29, 2018 – A High Point University Poll finds that North Carolinians overall may not be following March Madness very closely this year, and a majority of them say that college athletes that bring in a lot of money to their schools should not be paid to play. A majority of North Carolina residents (56 percent) say they are not at all closely following the NCAA Division I basketball tournament compared to only 12 percent who say they are following March Madness extremely closely, 8 percent who say very closely, and 24 percent who say somewhat closely. A near majority of these North Carolina respondents (46 percent) say the media pays about the right amount of attention to the tournament. About a third (36 percent) of North Carolina residents say the media pays too much attention, and only 4 percent say the media pays too little attention to March Madness. Almost three out of five North Carolinians (58 percent) say that student athletes should not be paid for the hours they spend practicing, traveling and playing for their team even if their programs bring in a lot of money to their schools. About a third (36 percent) of people in the state say the athletes should in fact be paid for their time on the team. How closely are you following the men’s NCAA Division I basketball tournament also called March Madness? Would you say extremely closely, very closely, somewhat closely, or not at all closely? Would you say that the media pays too much, too little, or about the right amount of attention to the men’s Division I NCAA basketball tournament also called March Madness? Top college and university men’s football and basketball programs bring in a lot of money to their schools from television, merchandising, endorsements, and alumni support. Do you think student athletes in these programs should be paid for the hours they are required to spend practicing, traveling, and playing on the team, OR should not be paid given the value of their athletic scholarship and a chance to earn a college degree?